So far this summer, soft ice cream appears to be my new favourite treat. Well, that and chocolate. But in all fairness chocolate has been a favourite a bit longer than just this summer. I’m trying to mix the two together now though which is new for me. 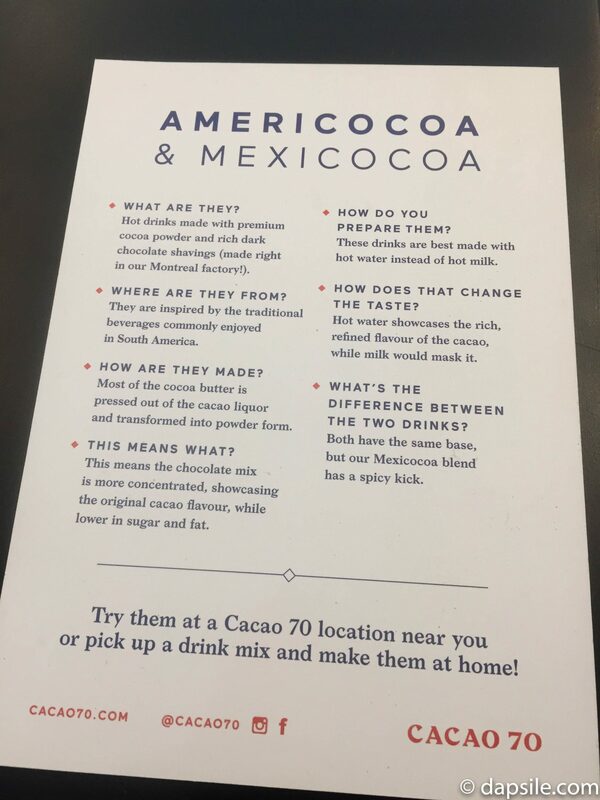 In my search for ‘unknown to me’ treat sources, I happily found Cacao 70. It’s like a bit of sweet chocolate heaven mixed with food. You know, a happy place to go and possibly receive a sugar coma if you decide to go all out. 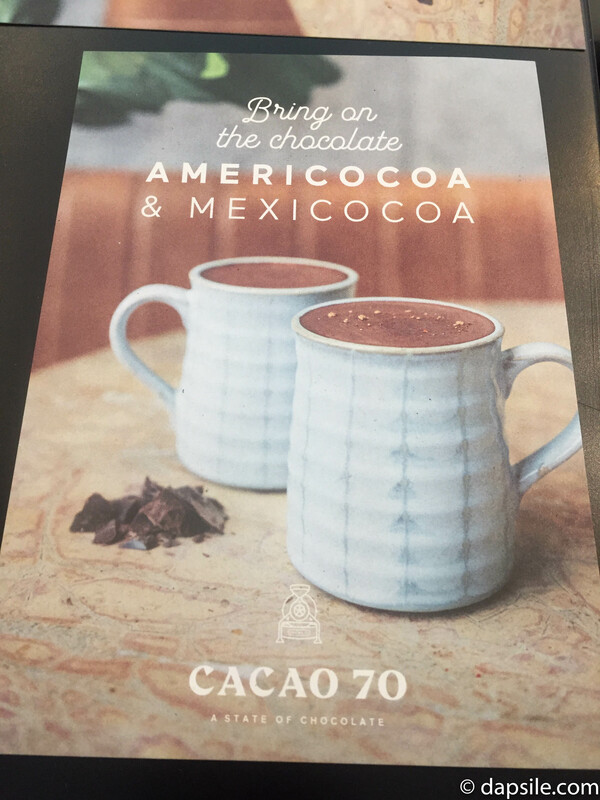 Cacao 70 (website) has three different types of shops, in three different locations in Vancouver. 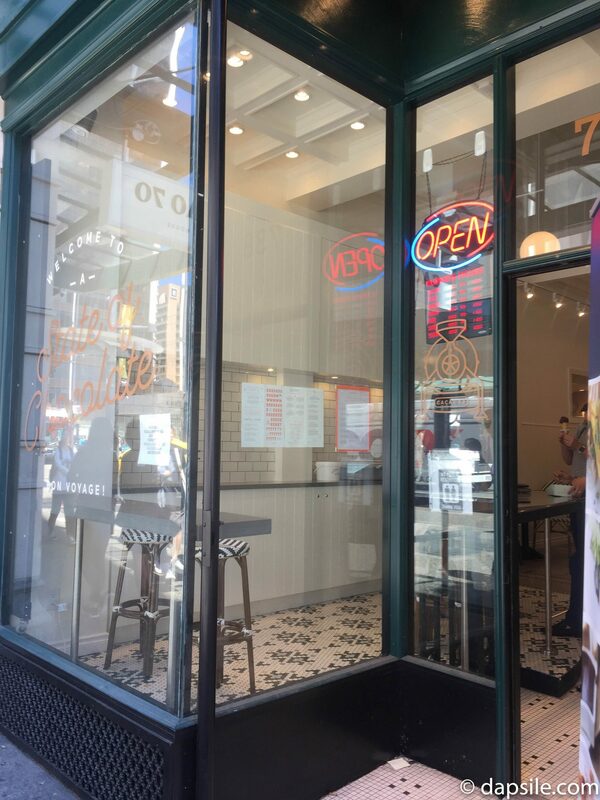 There is the Cacao 70 Dip Shop in Gastown, which is about chocolate dipped cones, and waffles. 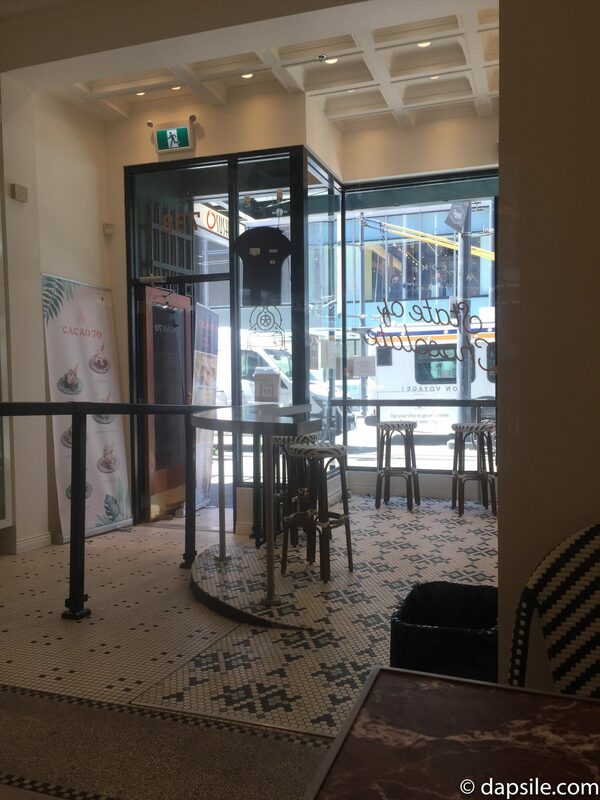 The Cacao 70 Eatery on Denman, which has chocolate treats like fondue, pizza (yup, really), and cake as well as things that come with chocolate like waffles and crepes. And the Cacao 70 Sweet House on Granville Street, which is actually a mix of both the Dip Shop and the Eatery. 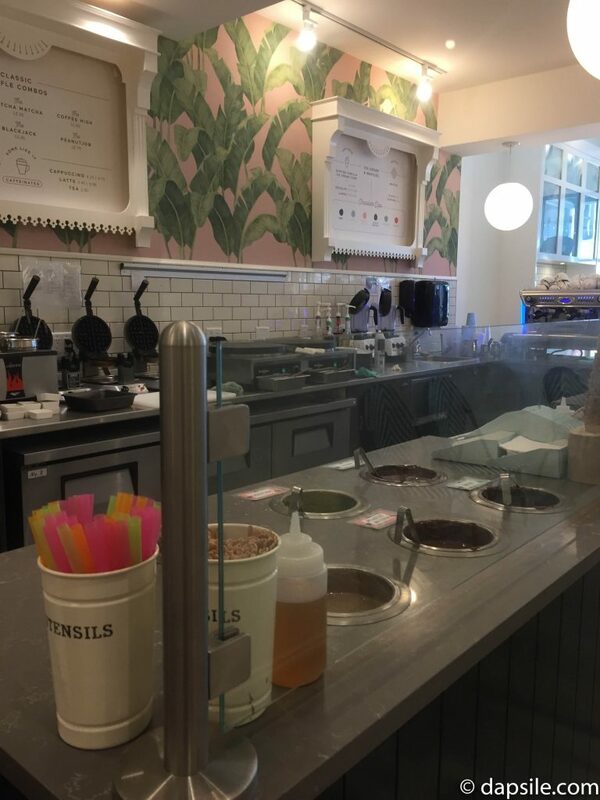 Plus, there is also a Cacao 70 Dip Shop in Richmond and a Cacao 70 Sweet House in North Vancouver. Each location also has coffee, tea as well as a pretty good hot and cold chocolate drinks selection. 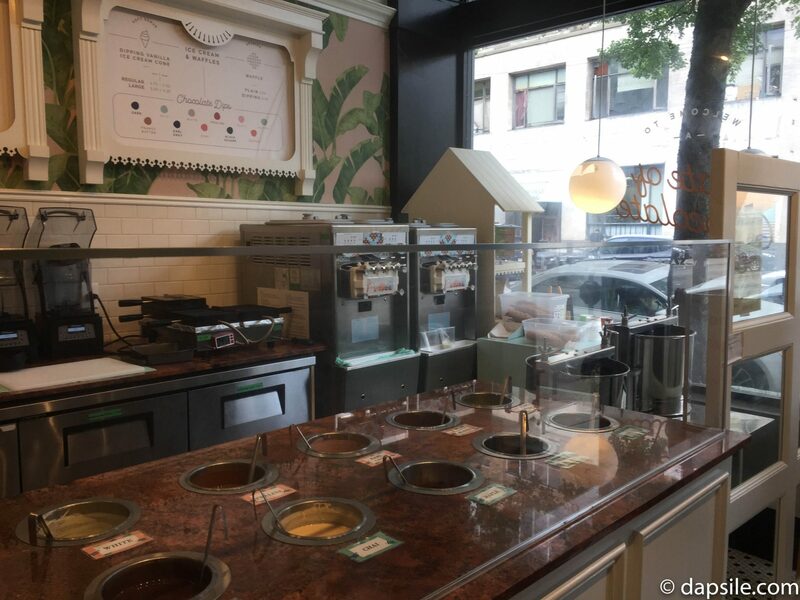 The Dip Shop in Gastown was the first Cacao 70 location I visited. 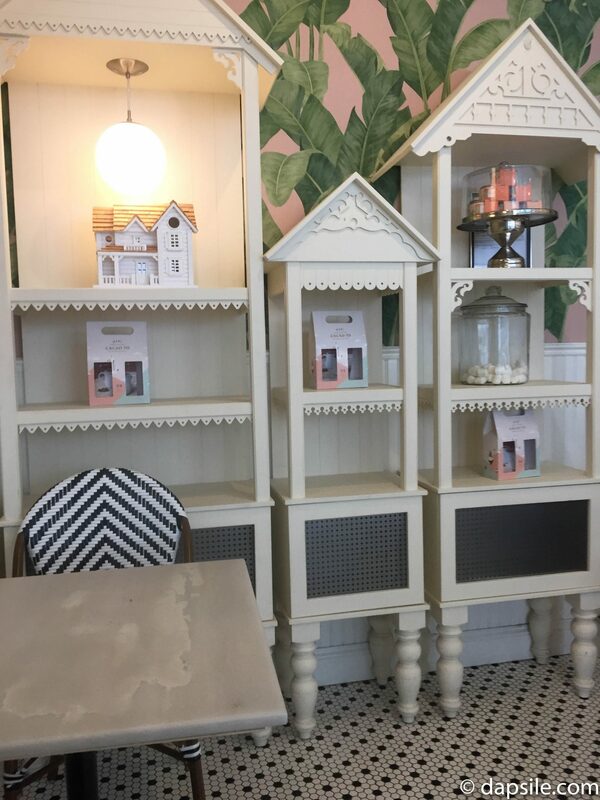 It’s a cute, small, shop with only like two or three small tables but you don’t need to stay and sit to enjoy this treat. Oh yah, there are also no public washrooms here. Or recycling. Because this is the Dip Shop, more emphasis is put on the chocolate dip flavours. 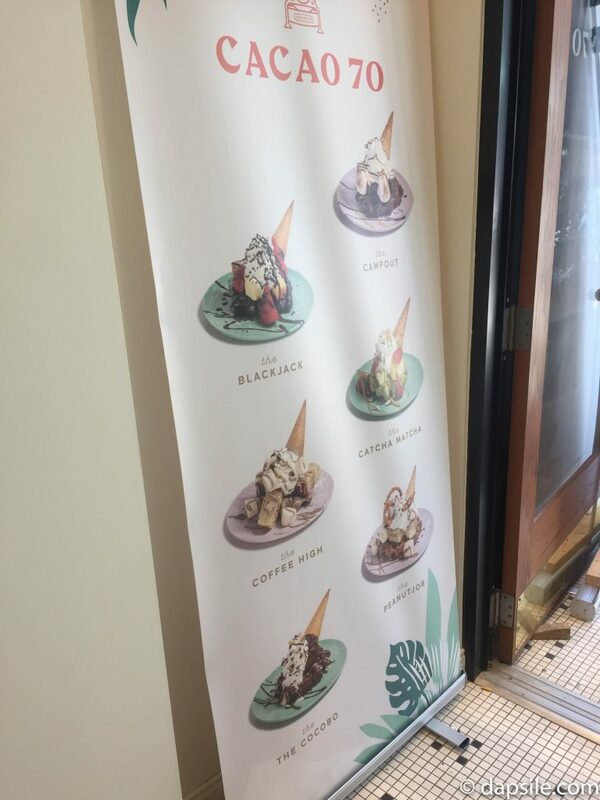 You are given 11 wonderfully flavoured, warm, liquid chocolate selections to choose from to mix with either a dipped cone, or a dipped cone and waffle combo. There are also two large mixing containers for you to watch chocolate being stirred, all behind the wall of drool protecting windows. The Sweet House on Granville Street, between Robson Street and West Georgia, was newly opened when I visited. This one is a long narrow shop which means it has more seats than the Dip Shop. There are counters and tables in the front, as well as tables along the sides and more in the back. 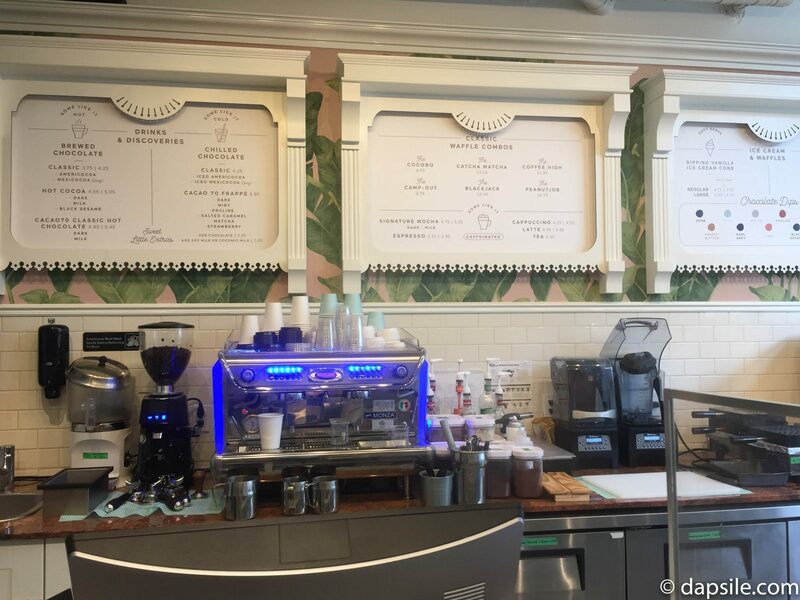 The set-up is pretty much the same as the Dip Shop but on a larger scale and with more menu items being offered. The location is also a much busier one. It’s a simple thing, but I felt the container of self-serve lemon water was a great addition considering all the sweet chocolate being sold and consumed. 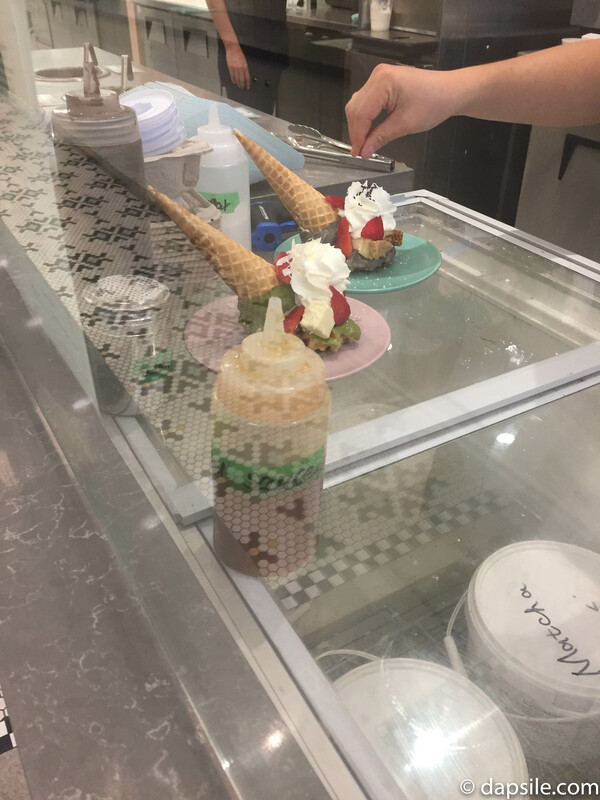 When I visited I ordered one of the dipped cone with waffle combos. These are mini masterpieces with several pieces involved and they are created once ordered so I did have to wait. Thankfully because there wasn’t anyone ordering or waiting in front of me, it was only a few minutes. I can see how it would be possible to have a long wait though, depending on how busy it was and how many people ordered the more time consuming items. 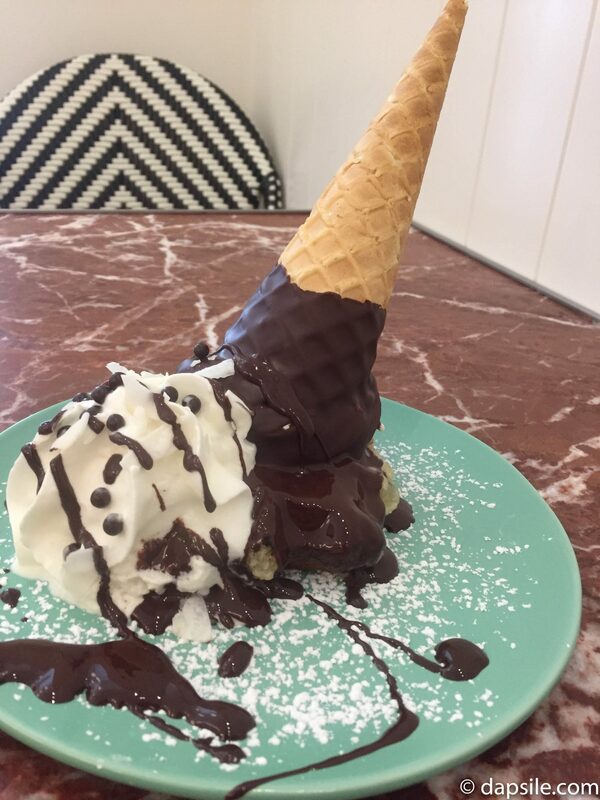 I went with a small cone dipped in the praline chocolate. It was delicious. 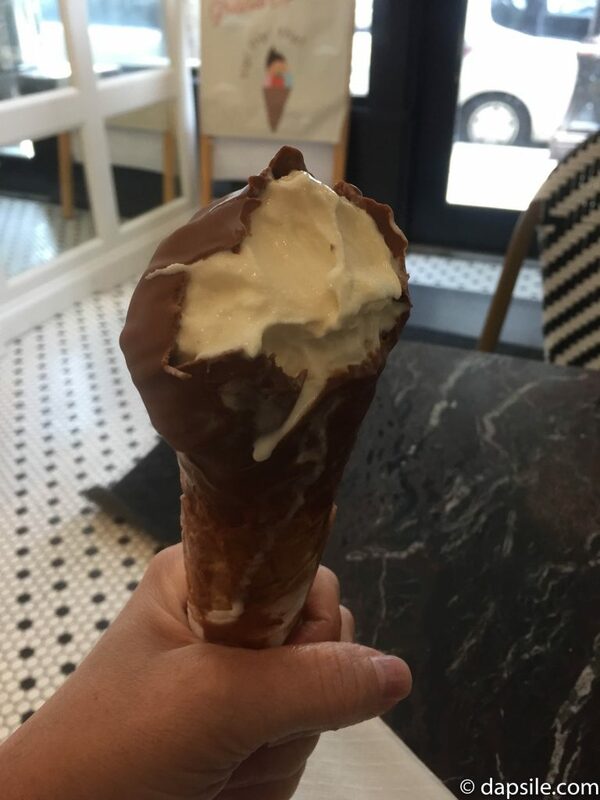 With a thicker than I expected layer of creamy, flavourful chocolate to get through before you even get to the sweet soft ice cream, the entire treat is quite sweet. I really enjoyed it. 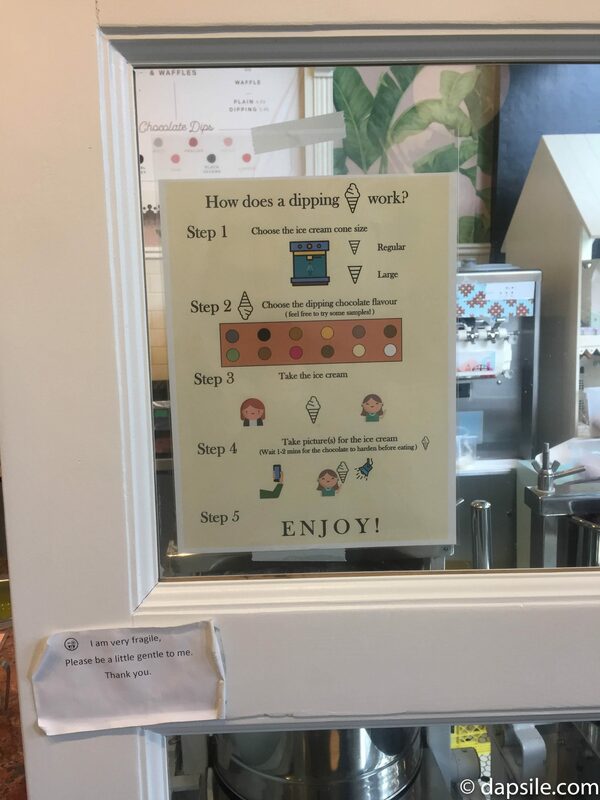 It’s a pretty simple process from ordering to eating, but thankfully there is a sign explaining it all because it’s not just about picking a size and dipping flavour. Step #4 is really important. Well, the part in the ( ) sure is and I feel like this is probably missed or underestimated, a lot. I underestimated it myself. You see, in the ( ) you are told to wait 1-2 minutes for the chocolate to harden before you start eating. I didn’t wait quite long enough obviously because I spent a lot of time trying to either catch the dripping ice cream or cleaning my hand. It was a bit messy and there was nowhere to wash up. I guess it depends on what you are looking for in your iced chocolate drink. I did not like this one at all. To me it tasted like it was made with powdered cocoa & ice, that’s it. 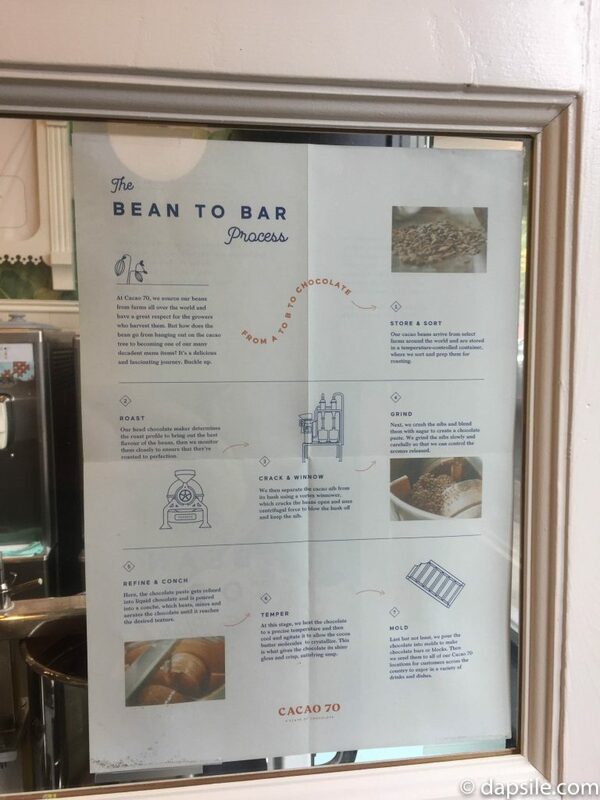 Turns out that pretty much is how it’s made. 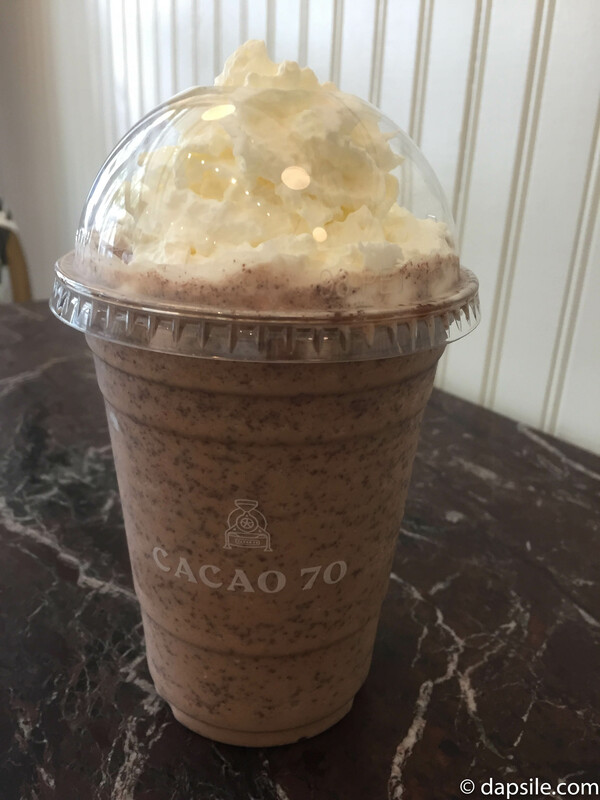 Their premium chocolate powder is mixed with a bit of water before it is blended with ice. I liked the fact it was more chocolate and less sweet but it was just kind of ruined with the powdered chocolate taste, so the taste buds weren’t impressed. That being said, I could see how this would taste better in a hot format so the powder can dissolve completely. I don’t like spicy chocolate so I didn’t try this one. I can tell you it contains a mixture of cinnamon, nutmeg, and cayenne pepper though. Holy crap, this one was a lot sweeter and way better than the powdered taste and granules of the Chilled Chocolate Classic. 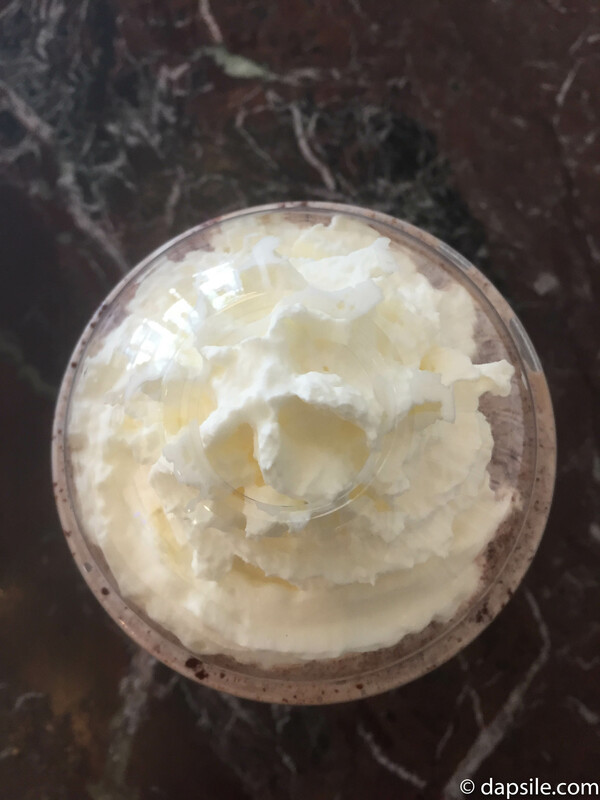 Besides having the option of milk alternatives, and whether you want to add a scoop of dipping chocolate, you are able to choose a flavour for your Frappe. Obviously the flavoured syrup makes it sweeter but the Frappe is also made quite differently than the Chilled Chocolate Classic. First, chocolate and cream are heated together and then refrigerated overnight to create a ganache. 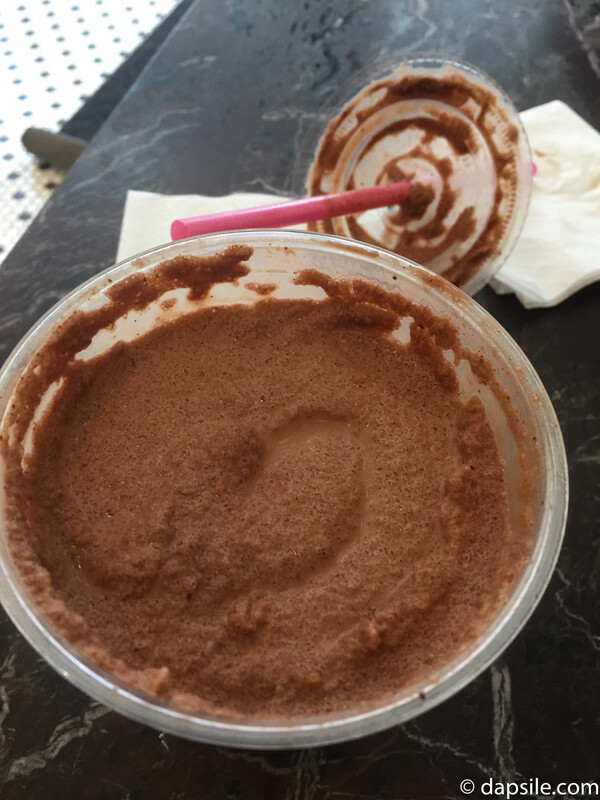 For the Frappe, a scoop of the ganache is mixed with milk, ice, and a flavoured syrup. You are delivered a much smoother, creamier, and sweeter beverage because of it. If you choose to, you can also add chocolate. This isn’t just any chocolate though, it is a scoop of one of the heated, melted dipping chocolates in either dark, milk, or white. I did it for information the first time but oh the next time, I’m going to do it for enjoyment. Because when the chocolate starts out warm and is added to the cold, it creates these soft chocolate pieces that melt in your mouth. There are six flavours to choose from for the Frappe. If you add chocolate to them, the suggestion is the first two flavours can be paired with dark chocolate, the next two with milk chocolate, and the last two flavours with white chocolate. But of course, choose whatever combo you want, I did. Wow! This was a lot of rich, sweet chocolate. It starts with a little mini waffle partially dipped in dark chocolate. 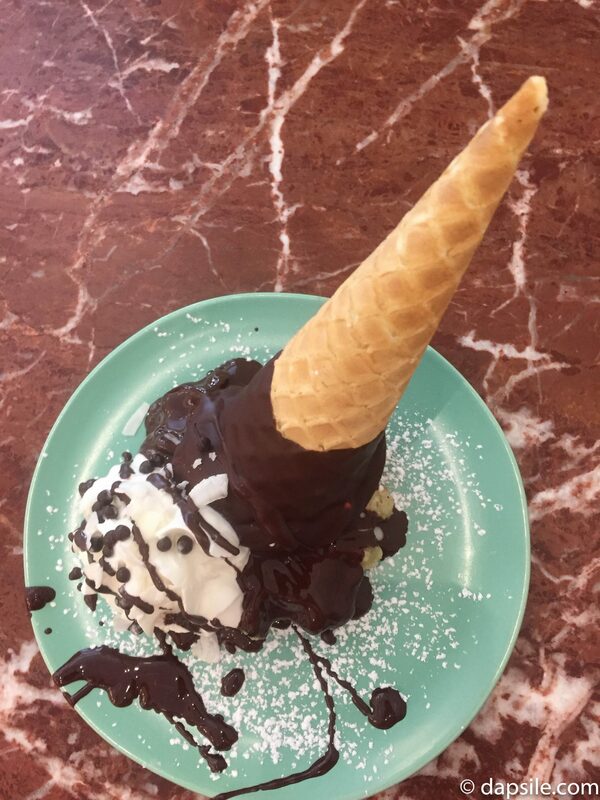 Then a mini waffle cone filled with soft serve ice cream and dipped in dark chocolate is placed upside down on the non-dipped portion of the waffle. It is then topped with whipped cream, chocolate drizzle, coconut chips, and little chocolate wafer balls. It is sweet, indulgent, and delicious. 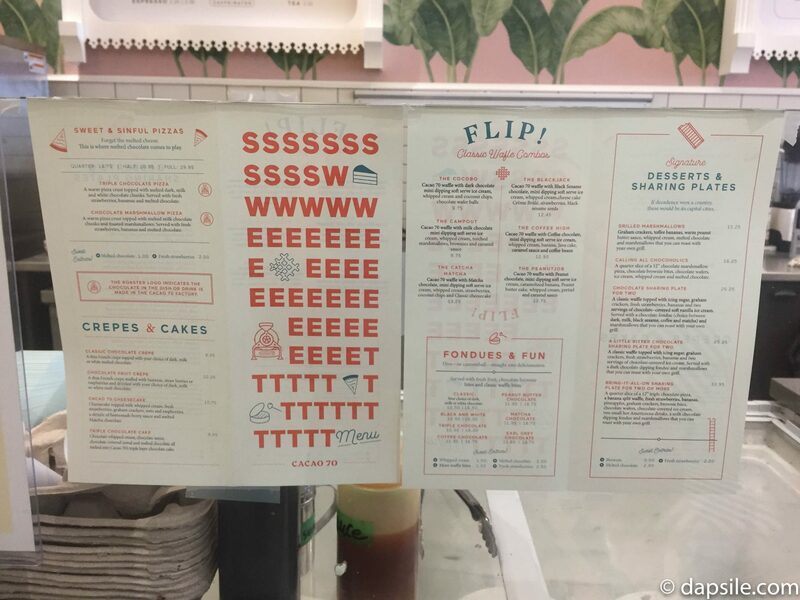 The waffle was a bit on the harder side though. It made it difficult to cut with the knife. 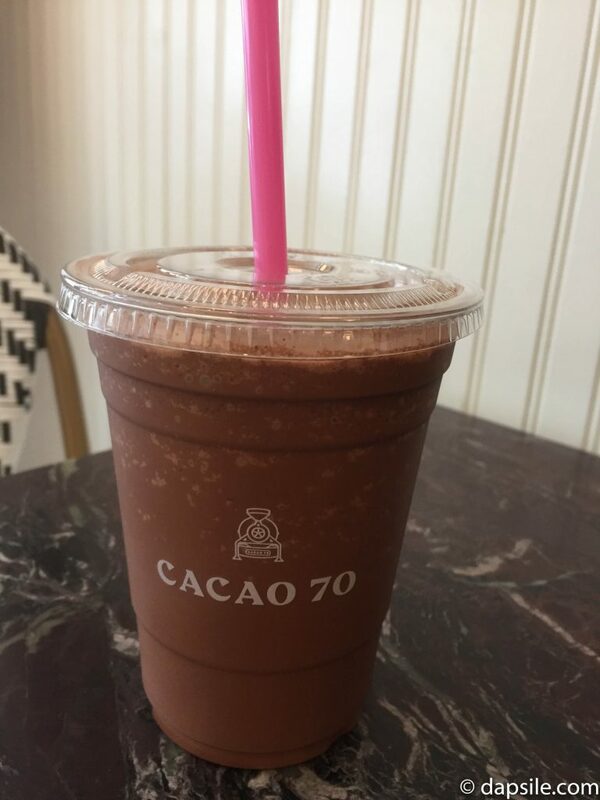 I haven’t tried this yet because the weather has been a bit too warm but I was told it was made with the premium chocolate powder and milk. Again, I haven’t tried this yet but I did find out how it was made during the colder months. Milk, cream, and chocolate chips are blended together and kept heated in the hot chocolate stirring dispenser (I don’t know what those things are actually called. Yet.) It’s obviously a creamier hot chocolate with both the milk and cream added.